Home » Diwali Lights » Winter Festival of Lights – a runaway success! Winter Festival of Lights – a runaway success! The 12th annual Diwali celebrations began in earnest on Saturday 10th November. By 10.00am the rain had passed and grey clouds lifted…..we were ready for Diwali!!!! As in previous years this is an event that brings the whole community together…Not only the Hindu community but community at large…even passers by can’t help but stop by and satisfy their curiosity…..well this year we certainly went all out to try and make the event even more attractive and inviting – new stalls were introduced – we had local businesses and community groups – jewellery, Indian clothing, beauty treatments, community stalls – St Andrews’ Dunstan Bennett (NHS), NIFF, Legal services, NPower and of course our own stalls – arts and crafts, information stands, Rangoli displays, saree sale, henna art, karom board game display, exhibition by Gujarati School and a food stall selling Indian food. The performances line up reflected greater diversity, richness of culture – young people expressing their skills and talents in both classical and modern forms of dance…a beautiful expression of The Diwali Story was performed by young students of the Gujarati School. 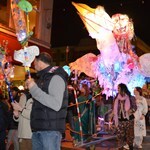 This year 10 schools were involved in the Diwali procession….and what a grand spectacle it was…..Festive Road delivered great workshops with Schools and produced some wonderful artwork – huge light structures of Ram & Sita, Ravan. The unmistakable rhythmic beat of the dhol together with Samba Band from Milton Keynes led the procession around Town Centre. This year we also had a group of young traditional Indian folk dancers from Leicester Maher Group join the procession which really helped to create a greater impact. It was lovely to hear the teachers and young people who were taking part for the first time express how much they enjoyed the whole experience. Congratulations and BIG thank you to all those involved – stall holders, performers and the volunteers who gave invaluable time and energy to help make the event such a success!